First week of school Classes started in the Southeast Cornerstone School Division last Tuesday. 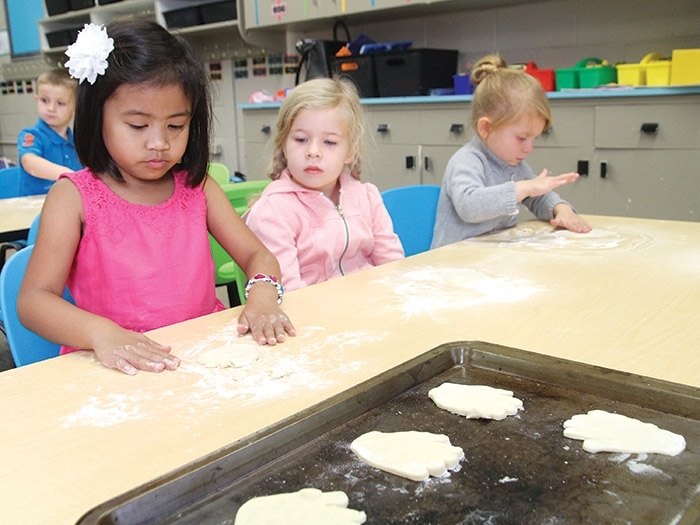 At left are MacLeod Elementary School Kindergarten students Jaeden, Evann and Kaydence making “kissing hand” cookies on their third day of class after reading a story called “The Kissing Hand” in Mrs. McMullen’s class. There are more students in local schools this fall. At Moosomin’s McNaughton High School, enrolment is rising rapidly. Projected enrolment was 288 two years ago, 330 last year, and 349 this year. But even more students than projected showed up on the first day of school—360 students were in class for the first day. Enrolment is expected to continue rising at McNaughton, with projections for the next three years at 394, 419, and 449 students. Tammy Cole, the principal at MacLeod Elementary School in Moosomin, said the school had a large class move over to the high school this year, but had more students than anticipated show up this fall. “We lost 56 students with our grade 5 students, but we had 12 new students enrol that we didn’t predict, so we’re sitting at 303 students this year, which is pretty close to what we’ve had over the last few years,” she said. Wawota is also seeing increasing student numbers. Wawota School had 176 students last fall, it had a projected enrolment of 181 for this fall, and it actually has 187 students this fall. Rocanville has seen a small increase as well. Rocanville School had 254 students last year, it had a projected enrolment of 257 this year, and had an actual enrolment of 261 at the start of the school year. Kennedy-Langbank School is also growing, going from 45 students last fall to 52 this year. Redvers School is seeing its enrolment holding steady, with 308 students this year, roughly the same as the 310 who were enrolled last year. Elkhorn School is seeing its enrolment holding steady, with 149 students in class this fall—exactly the same number as a year ago. Maryfield School saw a small decrease in student numbers this fall, but has more students than projected. Maryfield School had 106 students last year, and had a projected enrolment of 99.5 this fall, but actually has 102 students this fall. Wapella School is seeing a small decrease in student numbers. Last year’s enrolment at Wapella was 55 students, this year’s projected enrolment was 54, and the actual enrolment at the beginning of the school year last week was 52. Whitewood School has seen a small decrease in student numbers this year. Principal Brenda Dowd said Whitewood started last year with 264 students, ended the year with 257 students, and had 250 students enrolled by the second day of school this fall. McNaughton High School is seeing the largest enrolment increases in the region, and Principal Jeff St. Onge says the school population is not only growing, it’s also becoming more diverse. He said the percentage of students who are classified as English as an Additional Language is now more than 10 per cent. “Last year it was about 10 per cent. This year we’re at 360 kids and there are 44 on the EAL list, so the percentage has been growing,” he said. He said teachers have learned to accommodate students with some language needs. “We’ve been dealing with this for a while and we’re getting very good at it,” he said.